British economist considered one of the most influential of the Classical Economists whose contributions dominated economic thinking throughout the 19th century. 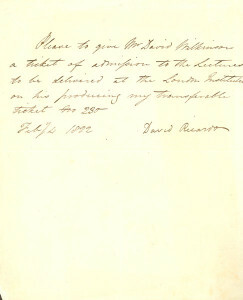 Autograph Letter Signed, one page, quarto, February 24, 1822. Born in London in 1772, David Ricardo was the third of 17 children of Dutch-Jewish parentage. At the age of 14, after a brief schooling in Holland, Ricardo’s father employed him at the London Stock Exchange, where he quickly acquired a knack for the trade. At age 21 he defied his parents’ wishes by marrying a Quaker, Priscilla Ann Wilkinson, and was disinherited by his family. He then set up his own business as a stockbroker in government securities, and was so successful that he was able to retire at age 41 and concentrate on his economic and political writings. At his death in 1823, his estate was worth approximately £725,000, and produced a yearly income of £28,000 (about $1.15 million in current US dollars). David Ricardo was friends with several of the leading economic thinkers of his day, including Thomas Malthus, James Mill and Jeremy Bentham. Working with Malthus he developed the Distributions Theory, which was the first economic theory to make use of the idea of diminishing returns. Distributions Theory states that as population grows, more land will have to be cultivated and the return from this land will not be constant because the amount of capital available will not grow at the same rate-newly cultivated land will suffer from diminishing returns and eventually returns will not be enough to attract any further capital. Ricardo’s Theory of Rent is also of note-rent is what remains from gross farm revenue (the unearned surplus) after all the farmer’s production costs have been paid, including remuneration for the capital and labor he had expended on the land. Rent arises from the advantages that one site has over another due to differing degrees of soil fertility: rent per acre is highest on the most fertile land, and declines to zero on the worst quality soil. David Ricardo’s most important theory is his Theory of Comparative Advantage concerning international trade, where if two countries have different opportunity costs for different goods, they will both come out ahead if they specialize in manufacturing and trading those goods in which they have a lower opportunity cost (or “comparative advantage”), even if one country has an absolute advantage in producing all the goods. This theory has become the strongest, most convincing argument in favor of free trade. David Ricardo also published treatises on the British monetary system, wages, and on an idea for a national bank. 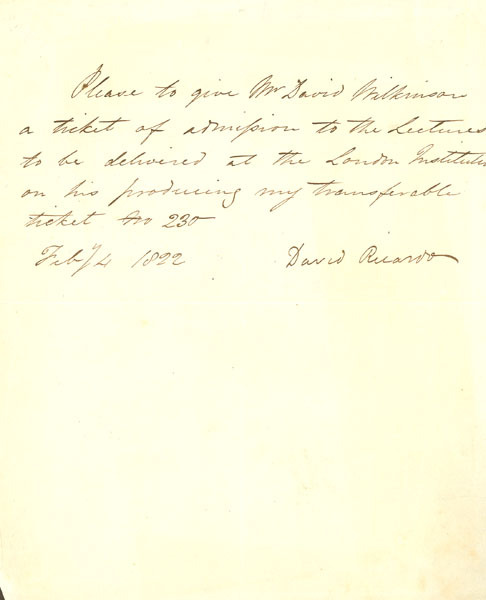 Among his important works published in 1822 are On Protection in Agriculture and Mr Ricardo’s Speech on Mr. Western’s Motion for a Committee to Consider the Effects Produced by the Resumption of Cash Payments. Ricardo was a member of the London Institution since its founding in 1805. It had a large reference library of books and newspapers, which he occasionally consulted. He became a member of Parliament in 1819 and served until his sudden death on September 11, 1823 from complications resulting from an untreated ear infection.